When the President shared his unfavorable opinion of the Supreme Court’s decision in Citizens United vs. Federal Elections Commission case during his January state-of-the-Union address (the US Supreme Court decided 5-4 in favor of Citizens United), he got a visible tisk-tisk from Chief Justice John Roberts for admonishing the Court, and some flack from the usual peanut pundits for breaking with some sort of legislative protocol in terms of the relationship and public roles of the executive branch and the U.S. Supreme Court. Can’t the President have an opinion too? This week, President Obama revisits his thoughts about the Citizens United decision (which benefits corporations, associations and unions alike when it comes to influencing elections with well financed messaging in his weekly message). It appears the President is still annoyed with BP too. This singling out hints at his earlier criticism about BP spending $50 million to “manage their image” vs. putting time and money into addressing the damage. Tomorrow, the Gulf Coast Claims Agency opens headed by Kenneth Feinberg who was jointly appointed by President Obama and BP (Feinberg administered the 9-11 Victim Compensation Fund). Application information is available here. Persons who filed claims earlier with BP will not have to refile with the agency. 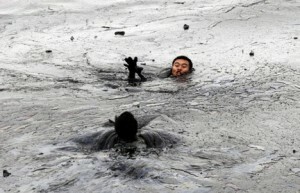 The agency is set up with the $20 billion BP promised to deposit into a special account set up for this purpose. 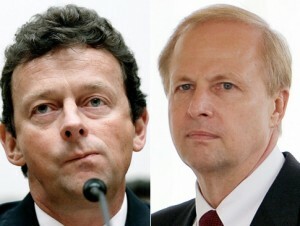 By August 9, BP had deposited an initial $3 billion into the escrow account (Citigroup Inc. is the corporate trustee). How BP will pay the remaining $17 billion has been under discussion. Perhaps singling out BP also signals how well these discussions may be going between the oil company and the White House. Meanwhile, at least one major leak is sealed for the time being. 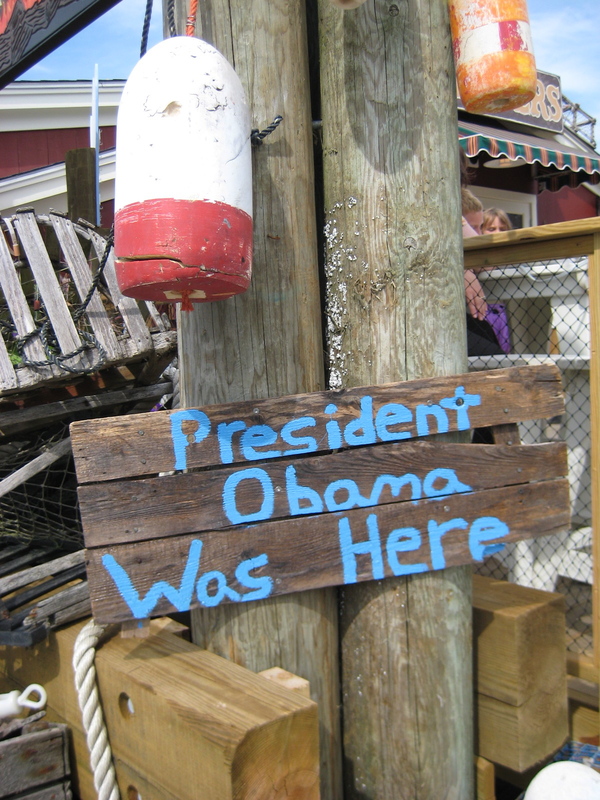 Eclectique916 was on the road (actually on the seas) this past week and has a presidential moment to share with the readers. Imagine what the first “Washington slept here” signs looked like. Or maybe taverns and other establishments weren’t initially as enthusiastic when a “first” came to call. This sign is outside Stewman’s Lobster Pound in Bar Harbor, ME where i had a delicious lobster roll, sweet potato fries, and slaw. 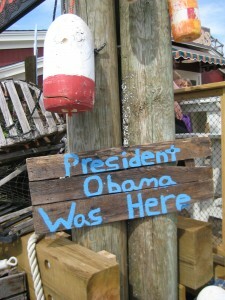 Being that the Obamas are kind of “foodies,” you can interpret the sign as you would the 4 star system. But does being “here” mean the same thing as “eating” here. I guess I should’ve asked but I was too enthralled with my food. The Obama family spent a weekend in Bar Harbor which included a tour of Acadia National Park. The peak is Cadillac Mountain. Our tour guide vacationed in Bar Habor for many years before putting down permanent roots. He had a lot of soul about the island. I was impressed that I could see the rocks and other natural objects through the water. There are some waters that you can’t swim or ride a motor boat because it’s used for drinking and other public consumption. You won’t find BP here. [Maybe a vacationing CEO.] 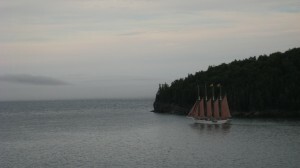 But you may find this blogger back on the Bar Harbor scene sometime in the future. 107 days later, BP has declared a “desired outcome.” It appears the blown out oil well has been plugged up with the “static kill,” a procedure of pumping heavy mud and cement into a well and sealing it at least for the foreseeable future. BP hit another milestone before recent developments — stopping the largest oil spill in human history. But we all knew the priority from day one was to recover as much profit oil as possible before shutting off the pipe. The next step is to deal with the litigation which for companies as large as BP, waiting people out may prove more beneficial than paying up. And truth be told not everyone has a legitimate claim. Nevertheless, many probably do. So the hardest part for me to believe is the report that most if not all of the oil “has been recovered, burned, dispersed, evaporated, consumed by microbes or otherwise removed from the water,” according to the Washington Post. After all this, what is the status of the Gulf as a “living” body of water? Has it been embalmed? So let’s talk about the damages specifically to the fisheries and the foodshed. Here’s a quote from a report prepared by Renewing America’s Food Traditions (RAFT), an alliance of food, farming, environmental and culinary advocates striving to restore endangered culinary traditions and cultures and promote healthy and sustainable food production. The “gloom and doom” that much of the media has emphasized since the spill is perhaps more dangerous to the seafood industry than the oil spill itself. Society at large needs to know now, more than ever, that Louisiana seafood is safe and available. Sure, some fishermen have chosen to work with the oil rigs and some fear that even temporary closures may put them out of business, but the majority is still working hard to supply the market. The report was written by Gary Paul Naghan (founder of RAFT), Leigh Belanger, and Regina Fitzsimmons. 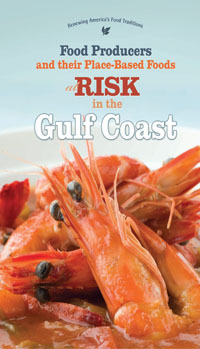 The report doesn’t say you can’t eat the Gulf produce; the question is “What’s left?” The report includes a list of edible species and varieties at risk in the Gulf Coast foodshed labeled as endangered or potentially affected by the spill (“oil-damanged”). Some were already on the list before the blow-out. Is it possible that food fear can do more damage to the fishing industry than the oil? Granted, people who depend on the waters for a living will have to “fish around” for better spots. But what about those dispersants that were used to clean up the oil? I guess they worked, but at what cost? The EPA is saying the dispersants are “not more toxic than the oil.” Well, that also says, “not less toxic” too. After all is said and done, President Obama’s cautious next steps will mean testing as part of the clean up. Solid verification wins out over weird science. I’m always tickled when parents freak out over a child’s decision to pursue acting in college. For the straight and narrow parent, it’s the “throwing good money after bad money” call. Personally, most of the serious actors I’ve known my lifetime were intelligent, insightful, and committed. The challenge was the ability to make a living or a fortune with their craft. It is why I don’t begrudge any of them from taking up second, third, or fourth careers or occupations. Why stay in the actor box especially in such a fickle business. For the mega successful ones, they have the resources and celebrity capital to explore other callings. They will give more and are willing to invest their own financial capital into the next act on their terms. This week Kevin Costner sold BP 32 centrifugal oil-and-water separators from his Ocean Therapy Solutions company at $500K each. If you’ve followed Kevin’s movie career, it’s a no-brainer to make the connection of the producer, actor, director’s interest in clean water solutions to his 1995 “Waterworld.” That was 6 years after the Exxon Valdez disaster. Costner bankrolled the development and research for this project. Sure, the story of an Academy Award winning producer type bankrolling technology lacks the romance of geeks in a garage; but check out this industrial video for the oil-and-water separator. This ain’t no “Waterworld” for sure. Edward James Olmos is also banking on his celebrity and his own boat. He took CNN’s Anderson Cooper out on his vessel (2 celebrities on a boat), but also invested his own movie making chops to this film about the gulf spill. Eddie isn’t about the science, but his own passion around the gulf spill as he considers himself a member of the boating community that navigates these waters. Perhaps the persons in the film aren’t identified for the sake of protecting their reputations and livelihoods (BP is the biggest game in town), but I’d be interested in knowing who they are and their connections. Sean Penn is profiled in the July issue of Vanity Fair for his hands-on, hunkered down humanitarian work in Haiti. Sean has set up camp on his own personal, political, and celebrity capital and on his own terms bringing food, medical and other relief aid to earthquake victims. For Sean this may be a third act after his divorce from actress Robin Wright Penn (his second). Not a guy who likes to be spotted by paparazzi on the home turf, but seems amiable to a few snaps of helping people in need. In the article Sean not only pumps his resources and considerable personal time, but is able to get Venezuelan president Hugo Chavez on the phone to send over morphine and other medical supplies, enlists prominent philanthropists to bankroll an organization, J/P Haitian Relief Organization, and influential friends across party lines who think Sean’s too cool and the cause too great, not to say “yes.” Here’s an example of how relationships with resources can come to the table and make things happen – baby steps though they may be in comparison to the devastation. Sean’s star power and dedication gives him access to a wide range of resources regardless of his politics or anger management issues with the shutter speed press. It also gives him resources to do his Haiti work on his terms eclipsing Wyclef Jean’s efforts through his Yele Haiti organization which came under financial scrutiny during the height of Haiti’s earthquake crisis. What Wyclef had in cool points among his fan pages on-line and off, and activist artists couldn’t match the access a Sean Penn has to world leaders, and to the personal and relationship resources with business movers and shakers; even Sean’s own Marlboro Man swagger with a side arm plays well with military personnel on the scene. Is it a matter of Sean fitting the narrative of Rebel with a Cause and money? It doesn’t hurt that the Hill is starstruck. A congressional hearing becomes the mutual love/envy fest of popularity and power. 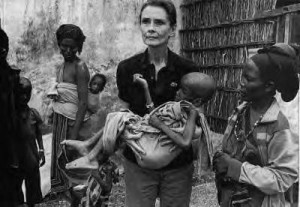 There is no picture so effective of a star with a cause than Audrey Hepburn in Somalia. She had her day in the sun but UNICEF became a new calling and a new day. Audrey offered her compassion as well as her celebrity. She became a role model for future UNICEF spokespersons. This was not a cause Holly Golightly would take up; perhaps it’s where Sister Luke in “The Nun’s Story” (a serious role for Hepburn) left off. This week the President made his third trip to the Louisiana coast in lieu of a trip to Australia and Indonesia, to check on the lack of progress of BP’s next move on capping the oil pipe as well as the lack of confidence in the administration’s ability to bring BP to heal. Though the President appeared to put too much confidence in BP’s abilities and intentions, I do have to say during the “drill baby drill” spasm of the 2008 election, many people of all stripes had no problems with deep sea oil drilling as long as the money was coming in and there were no new taxes at the gas pump. In other words, let’s spread the lack of skepticism and critical assessment of BP’s and similar companies enterprises around. When profits are involved, everyone’s got a stake in anything. Check this out from the editorial staff of the Times-Picayune. We’re already reeling from the loss of thousands of fishing industry jobs. We now could see an estimated 20,000 oil-services jobs vanish due to your six-month federal moratorium on deepwater exploratory drilling. That could do even greater damage to the economy than the well-chronicled fishing industry losses. The next showdown: fishermen vs oilmen. Harks back to the cattle and sheep feuds of the old days or a new cast of characters for the WWF. At least Cameron has developed robotic technology for deep water filming. There’s no need to brush him off as just another egotistical Hollywood director. … I’ve authorized the deployment of 17,500 National Guard troops to aid in the response. More than 20,000 people are currently working around the clock to protect waters and coastlines. We’ve convened hundreds of top scientists and engineers from around the world. More than 1,900 vessels are in the Gulf assisting in the clean up. More than 4.3 million feet of boom have been deployed with another 2.9 million feet of boom available – enough to stretch over 1,300 miles. And 17 staging areas are in place across Louisiana, Mississippi, Alabama, and Florida to rapidly defend sensitive shorelines. In short, this is the largest response to an environmental disaster of this kind in the history of our country. We’ve also ordered BP to pay economic injury claims, and we will make sure they pay every single dime owed to the people along the Gulf Coast. The Small Business Administration has stepped in to help businesses by approving loans and allowing deferrals of existing loan payments. And this week, the federal government sent BP a preliminary bill for $69 million to pay back American taxpayers for some of the costs of the response so far. In addition, after an emergency safety review, we’re putting in place aggressive new operating standards for offshore drilling. And I’ve appointed a bipartisan commission to look into the causes of this spill. If laws are inadequate –laws will be changed. If oversight was lacking – it will be strengthened. And if laws were broken – those responsible will be brought to justice.